Sarah saw a gap in the Marquee Hire Market for themed parties and chill out tents at festivals. She did her research and couldn’t find anyone providing the type of Marquee she would want to hire. Sarah founded Posh Frocks and Wellies in the spring of 2010 and already has a number of successful events under her belt. To provide Posh Frocks and Wellies with a cost effective entry to the Market Hire Industry for themed garden and festival events. BARKERS Marquees supplied Posh Frocks and Wellies with a Traditional Pole Marquee, linings and dance floor which can accommodate between 25 – 100 people at a function. BARKERS made sure that Posh Frock’s construction team were trained to construct and maintain the Marquee plus its Lining. Using their extensive industry contacts and knowledge they were able to advise Sarah on essential start up information such as other useful suppliers, Health and Safety Standards and MUTA. Posh Frocks and Wellies offer four themes; Rock the Kasbah, Rose Garden, Country Chic and Ambient Dub; three of which are shown below. 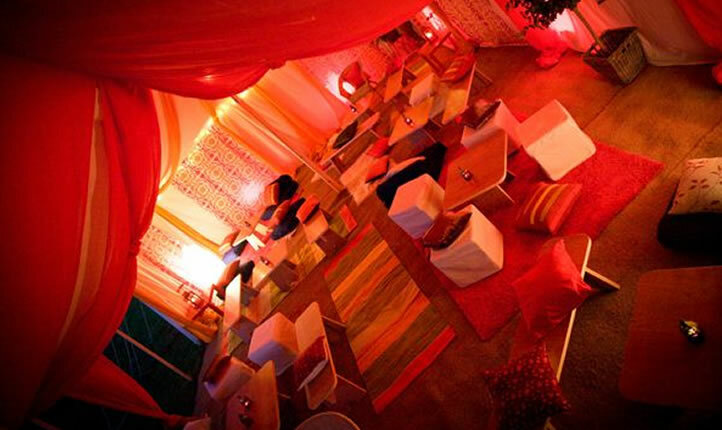 Rock the Kasbah uses warm orange and ochre muslin drapes to stimulate the senses. Lit with Moroccan lanterns and fairy lights and furnished with sumptuous rugs and cushions, it creates a beautiful ambience for social gatherings. The Rose Garden theme reflects all the finest of English traditions, with pretty pastels in gingham and floral prints, comfortable wicker armchairs and tables and bunting and of course lashings of hot steaming tea (pass the cucumber sandwiches!). The Country Chic theme gathers wild flowers, grasses, ‘scrumping apples’ and twigs from field and farm then uniquely arranges them within the marquee. With pretty frosted glass lanterns and fairy lights nestled in twigs and ivy, and soft muslin drapes the interior becomes transformed into an enchanting space for special events. As Sarah says ‘BARKERS Marquee have been crucial in helping our business source reliable products through not only their own trusted marquee structures but also directing to suppliers of all the necessary equipment needed for a new start up marquee hire business. They have guided us through the whole process including training on erecting the marquee, fitting linings, health and safety issues and MUTA standards. They provide excellent ongoing after sales support.